Most states and the District of Columbia impose a deed transfer tax when real property changes hands. This sales tax is based on the value of a given property. It applies to a transfer of full ownership from seller to buyer. It is also applied to any percentage of the property that is conveyed short of the entire property. Thus, if one co-owner relinquishes joint ownership in the entire property, the tax is calculated on half of the value. Also called the real estate transfer tax, the deed transfer tax is distinct from property taxes. When the county collects the transfer tax for the state, a stamp goes on the deed. Thus, the tax is a form of stamp tax. Florida and Pennsylvania use the term documentary stamp tax. Ohio calls it a real property conveyance fee; Rhode Island calls it a real estate conveyance tax. A few states use the term deed recording fee. Washington State uses the term real estate excise tax. Deed transfer taxes can also include taxes imposed by the county or city. Across the United States, the higher end of the total transfer tax can amount to more than 4.5%, taking the example of Allegheny County, PA (home of Pittsburgh). In the city of Philadelphia you’ll also pay more than 4%: 3.278% to the city plus 1% to Pennsylvania. Delaware’s transfer tax at the time of this writing is 2.5% of the property’s sale price plus a county transfer tax of up to 1.5% – a total of 4%. (If the Delaware county imposes no transfer tax, the state can then impose a tax as high as 3% of the property value.) The buyer and seller split the tax. The seller pays 1.25%. A first-time buyer pays only .75%, not 1.25%, if the home costs $400,000 or less. Florida documentary stamp taxes use a calculation process. To make it simple, imagine a condo in Lee County that sells for $100,000. Divide the sales price by 100, then multiply by .70. That’s 1000 x .70 = $700 for the documentary tax stamp. In Miami-Dade County only, use 1000 x .60. The New York State transfer tax rate is $2 per $500 of the home price, plus a 1% “mansion tax” for homes selling at $1 million and higher. Some counties levy more. In New York City, transfer taxes can amount to 2.625% of a property’s value. Look for mortgage recording taxes, too, in New York City. New York has many local optional taxes that vary by county. The deed transfer tax is a closing expense – traditionally the seller’s responsibility. Often, though, the buyer agrees to contribute. In Washington, DC, the law requires the buyer and seller to split the deed transfer tax. Where the parties may negotiate their portions, their agreement should appear in the home sale’s contract terms. The Internal Revenue Service does not consider deed transfer taxes deductible. The buyer should add any transfer tax paid to the cost basis of the asset, to offset capital gains when selling later. Who Does Not Pay the Tax? Several states exempt first-time home buyers from a percentage of the total deed transfer tax. For example, a first-time homebuyer in Maryland need not pay, although the seller must pay .25%. Each state has its own provisions. There may be other situations in which the tax does not apply. Alaska has no transfer taxes. Arizona has only a flat $2 transfer fee. California is an interesting case. It has no transfer tax, but has an optional county transfer tax of $0.55 per $500 of the home value. Cities in a county that charges the tax can also have a transfer tax, at half of the county’s rate: $.275 per $500. The city tax can be credited against the county tax. California also has an instrument recording fee for any conveyance of property, presently capped at $10. Idaho, Indiana, and Louisiana have no transfer taxes. Mississippi, Missouri, and Montana are also free of transfer taxes. Kansas has no transfer tax but does impose a mortgage registration tax of 0.1%. North Dakota has no transfer tax. Oregon has no transfer tax except in Washington County, where it is a modest 0.1%. New Mexico does not impose a transfer tax. Indeed, New Mexico has been rated first in the country for those seeking overall tax advantages. Texas, Utah, and Wyoming have no transfer taxes. 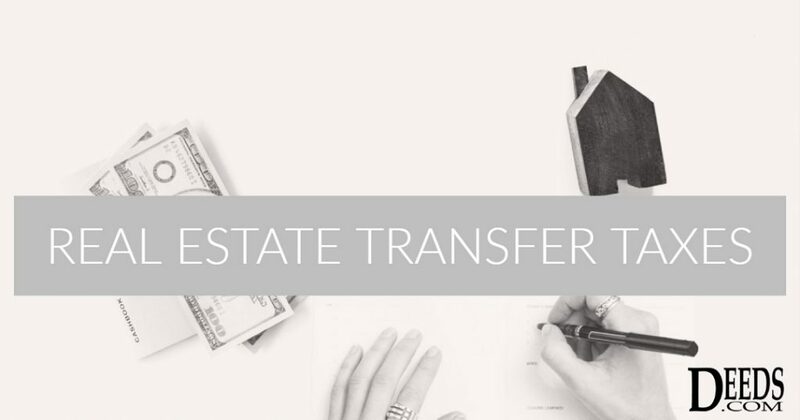 Deed transfer taxes are part of the normal cost of real estate deals in most states. Some states also impose a mortgage tax, paid by the buyer through the closing costs. This tax may vary by locality within the state. We offer this synopsis of transfer taxes as a service, only to provide general knowledge regarding the laws and rules. Ask the county clerk where your property is located about case-specific circumstances. At Deeds.com, we diligently seek and offer you the most up-to-date information available. Keep in mind that that state and local taxes can and do change.